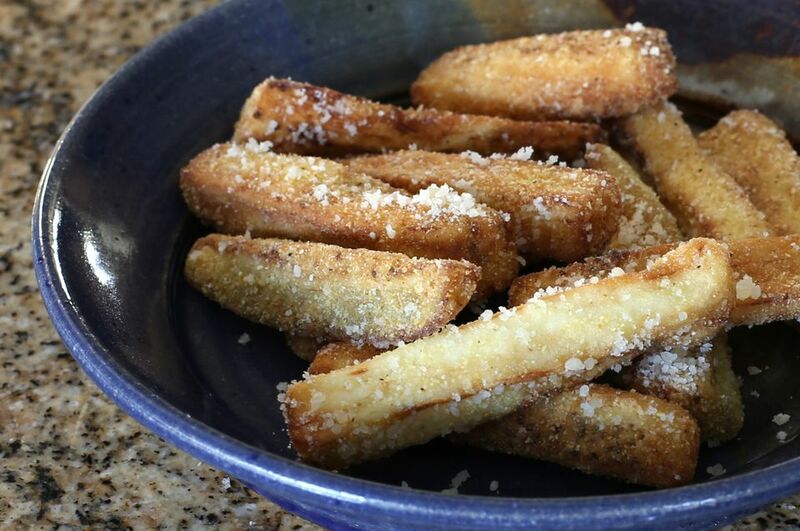 These deep-fried eggplant strips are crispy and delicious, and they are an excellent alternative to higher carb French fries. Coated in flour, then dipped in an egg wash, and rolled in breadcrumbs, the eggplant strips fry up to be crunchy on the outside and tender on the inside. The coating is not as thick as a battered deep-fried eggplant strip, but this version is melt-in-your-mouth goodness none the less. These eggplant strips are wonderful on their own, but when served with a flavored mayonnaise, tomato or tomatillo salsa, or a ranch or blue cheese dip, they become an impressive appetizer or even afternoon snack—and your family and guests will be begging for more! You can also sprinkle the fried eggplant strips with Parmesan cheese and serve them with warm marinara sauce as a nod to an eggplant Parm. Peel the eggplant using a sharp knife or vegetable peeler. Slice it into 1/4-inch-thick sticks about 3 inches in length. Put about 2 inches of oil in a deep, heavy saucepan and heat to 370 F (188 C). Put the flour in a shallow bowl. In another bowl, beat the egg with the water. Put the breadcrumbs in a third bowl. Sprinkle the eggplant pieces lightly with salt and freshly ground black pepper. Roll the eggplant pieces in the flour, shake off any excess, and then dip into egg mixture. Let excess egg drip off before rolling the strips in the breadcrumbs to coat. Fry the coated eggplant pieces in the hot oil until golden brown, about 2 to 3 minutes, turning them as they cook. Transfer the eggplant strips to paper towels to drain and sprinkle lightly with kosher salt. Serve hot with lemon halves or a dip, if desired. Choose an eggplant that is firm and feels heavy for its size. Avoid eggplants with cuts or scars. The caps and stems should look fresh and green. Long, slender eggplants are not as juicy as the round, plump eggplants, and are better for frying. These crispy eggplant strips are delicious dipped into a flavorful sauce. Try chipotle mayonnaise for a little added spice. Combine 1/2 cup of mayonnaise with 1 or 2 finely chopped chipotle peppers in adobo. Add some finely chopped cilantro, 1 teaspoon of lime juice, and about 1/4 teaspoon of garlic powder. For even more heat, make a spicy chili mayonnaise. Combine 1/2 cup of mayonnaise with 1 tablespoon of Sriracha sauce and 2 teaspoons of garlic chili paste (Sambal), along with 1 teaspoon of lemon or lime juice. If you thought blue cheese dip was just for chicken wings, think again! To make your own, combine 1/2 cup of sour cream with 1/3 cup of mayonnaise, a dash of salt, and about 1 ounce of crumbled blue cheese. To add a little bit of flavor to the eggplant, use seasoned breadcrumbs instead of plain. Italian, Parmesan, and garlic seasoned breadcrumbs are good options. Add about 1 teaspoon of chili powder to the plain breadcrumbs along with a dash of cumin to give them a kick.